Harry Shepherd Van Denberg (1885-1963), was born on May 7,1885, son of LaGrange Van Denberg (1857-) and Mary Esther Shepherd (1861-) at Charles City, Iowa. As a young boy he collected coins and stamps. By 1899 his family moved to Webster City, Iowa, where young Harry ran a mail order stamp business, the Vandenberg Stamp Company. He moved to Rockford, Illinois about 1905 working as a bookkeeper for the Wayburn Company. In 1906 he joined the American Philatelic Association. On January 15, 1906 he began working for Fred K. Houston owner of American Heating Company, a plumbing, heating and janitorial supply company. In 1907 he worked as a draftsman for the American Heating Company. In 1908 he was the assistant manager of the American Heating Company. He lived at 617 Park Avenue, Rockford, Illinois. In 1910 Houston sold out to three employees and Van Denberg became the secretary and treasurer. In 1911 he was the secretary and treasurer of the American Heating and Supply Company. He married on April 26, 1910 Alice Bickford Emerson (1886-1935), daughter of Charles H. Emerson. They had a daughter Mary Elizabeth Van Denberg (1914-1990) and a son Edward E. Van Denberg (1917-). In 1920 he became independent with his own form Van Denberg Supply Company. In 1920 he became independent with his own form Van Denberg Supply Company run by he and his wife Alice. Alice died on March 2, 1935. He retired from the plumbing supply business in January 1946. Fig. 1. First Day Cover, January 1, 1949, New 6 cent rate for Air Mail. 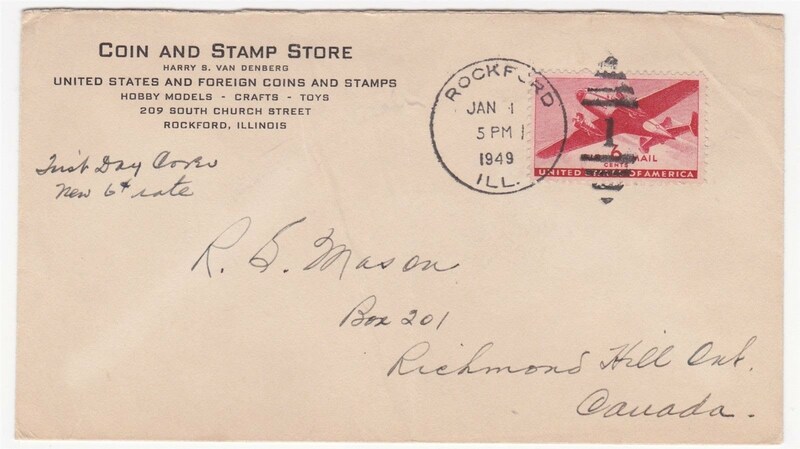 Harry S. Van Denberg, Coin and Stamp Store, Rockford, Illinois. Courtesy Lupia Numismatic Library. Since 1946 he was the owner of the Coin and Stamp Store, 209 South Church Street, Rockford, Illinois. His store was the new emerging Hobby Shop phenomenon in America, a spin off of the Old Curiosity Shop, instead of old books, artworks and antique and antique novelty items they sold instead models, crafting supplies, toys, as well as coins and stamps. According to Numismatic Scrapbook, in 1948 he called the ANA auction at Boston, Massachusetts held by Frank J. Katen. In 1954 he attended the ANA Convention at Cleveland, Ohio. In 1959 his second wife Louise Rose Randall died. 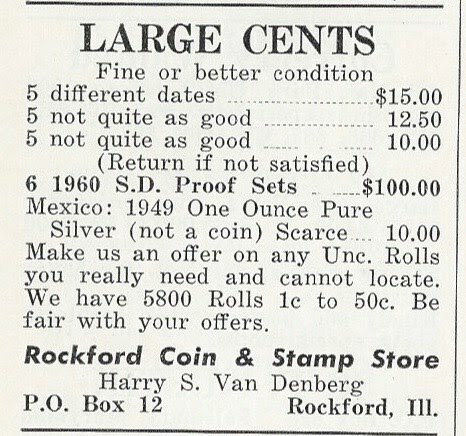 In the 1960’s he called his shop the Rockford Coin & Stamp Store in his ads in Numismatic Scrapbook. His last ad ran posthumously in March 1963. 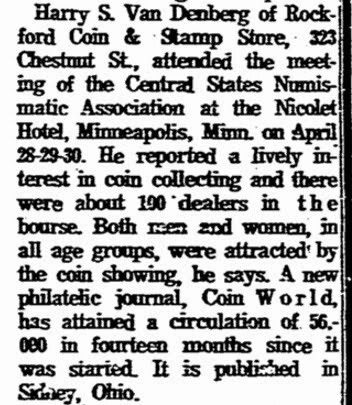 On April 28-30, 1961 he attended the Central States Numismatic Association meeting at the Nicolet Hotel, Minneapolis, Minnesota, as a vendor and exhibitor. He suffered from cancer of the throat and mouth. He committed suicide by a self-inflicted gunshot wound to escape the pain and suffering of his cancer. He died on February 26, 1963, at the age 77 years old. He was buried at Willwood Burial Park, Rockford, Illinois, on March 1, 1963. He was a member of the Rockford Elks Club; Rockford Rotary Club; Star in the East Masonic Lodge 166; Crusader Commandery 17; Tebala Shrine; American Philatelic Society; Rockford Council 30—Royal and Select Masons; and Winnebago Chapter 24—Royal Arch Masons; American Numismatic Association; Central States Numismatic Association. 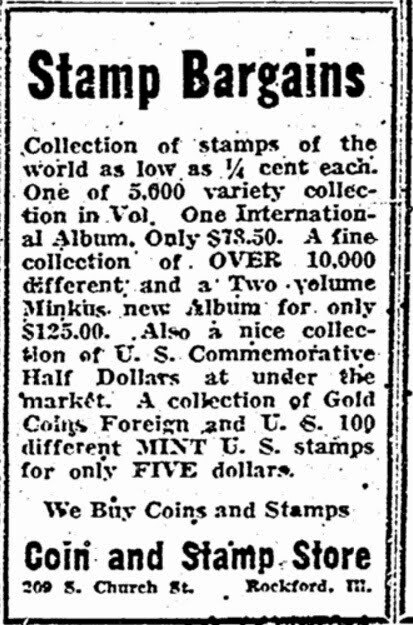 Register-Republic, July 10, 1954 "Small Size Currency" story on Harry S. Van Denberg and F. C. Dennehy.